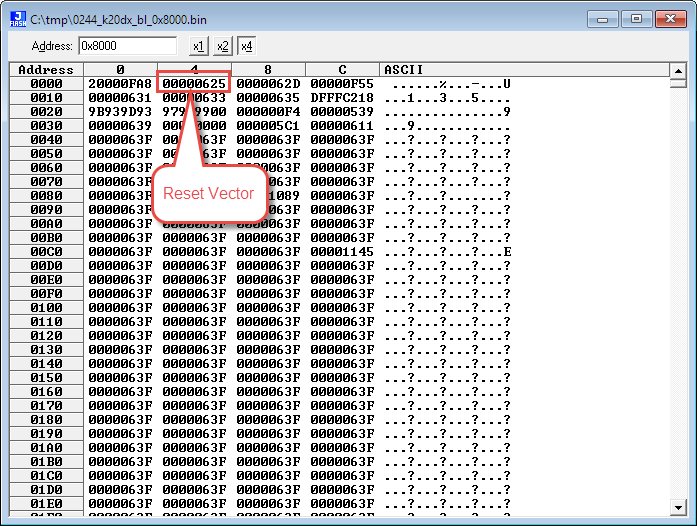 This article describes how to patch the ARM mbed DAPLink bootloader so it works with relaxed timing. It describes how to analyze the bootloader, how to write a small assembly program and how to inject it into the bootloader to work around a weakness in the ARM bootloader during power-up. 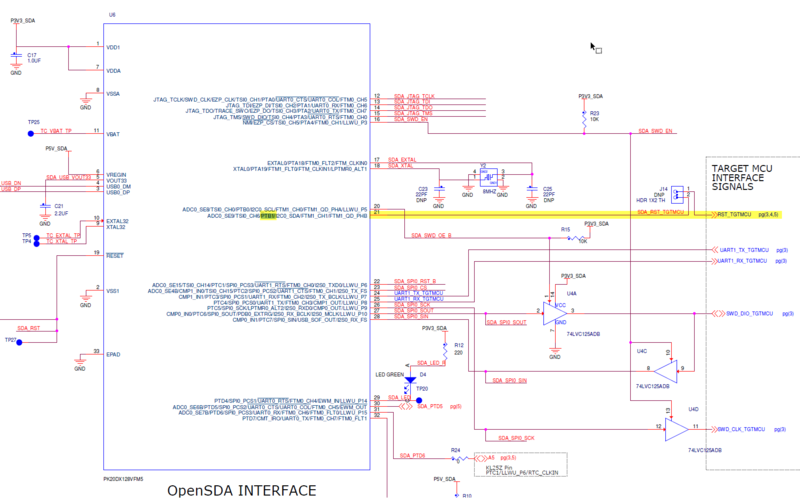 The mbed (or OpenSDA) bootloader uses a virtual USB MSD (mass storage device) to update the board with a new application binary. The problem with MSD is that it might get confused what the host machine is sending, e.g. if the host is scanning the new device for viruses/etc. Because the developers did not foresee such a situation, the receiving packets might brick the bootloader and board. Luckily, the board can be unbricked with JTAG/SWD programmer like a P&E Multilink or a Segger J-Link (or use a NXP Freedom board, see links section). ARM has released a new bootloader v244 (see DapLink). The approach requires pyOCD which is imho is yet another can of works for troubles. Instead, I recommend to invest a few $ into SWD/JTAG programming device (you get a NXP LPCLink2 or a Segger J-Link EDU for $20 these days). The latest DAPlink releases can be found on https://github.com/mbedmicro/DAPLink/releases. The bootloader on the K20/OpenSDA checks the voltage on PTB1/reset line during startup: if the level is LOW, it enters bootloader mode, otherwise it starts the application. The problem with that is that this is very timing sensitive: consider the case where during power up the K20/bootloader runs a bit faster than the logic level of the reset line gets pulled up (by a pull-up resistor). This gets even trickier if different power supplies are used with different reset line capacitance. As a result, if the K20/bootloader comes up ‘too fast’, it might ‘see’ a LOW on the reset line and enters bootloader mode. This especially happens if the board gets plugged in by the USB port and gets powered up. A workaround is to keep the K20/bootloader in reset for a few seconds until all the voltages have been stabilized. But always keeping the reset button pressed while powering the board is painful. The obvious solution would be to change the bootloader to add a short delay (say one second) in the bootloader until it checks that PTB1 pin. But building the mbed bootloader from sources is definitely not easy or simple. 💡 I wish there would be a simple make file project for the bootloader using standard GNU tools. With no proprietary RTOS (why not FreeRTOS, or better: no RTOS at all) making it hard to understand and build. So I thought: adding a small patch to delay the bootloader should not be a big deal. And indeed that was accomplished in less than half an hour. So all what I need is to jump to a small delay routine instead and then continue with the execution at 0x624. The above function delays for as short time (depending on the clock speed) and then jumps to 0x624. 💡 You can adjust the time with the two loop counters, but make sure it is not too long, as otherwise it could trigger the watchdog. Disable the watchdog in that piece of code too. I verified the code with the debugger, to be sure it works properly. With this I verified that may patch is working. 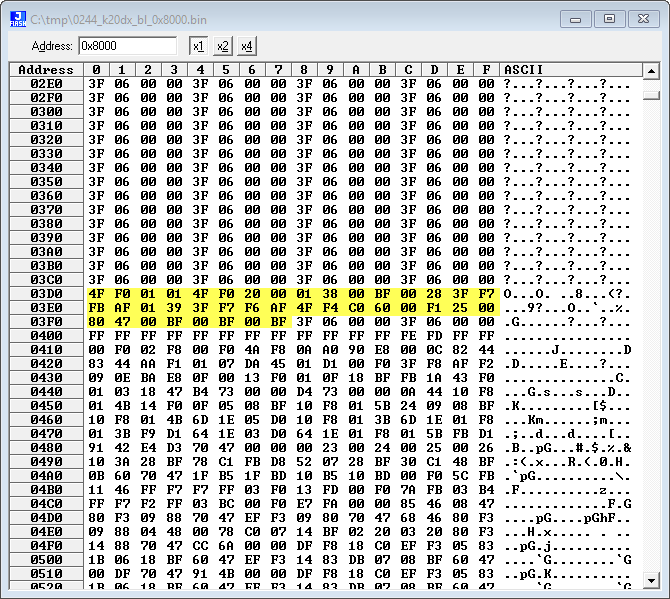 I have now the series of bytes I have to insert. The next step is to patch the bootloader itself. 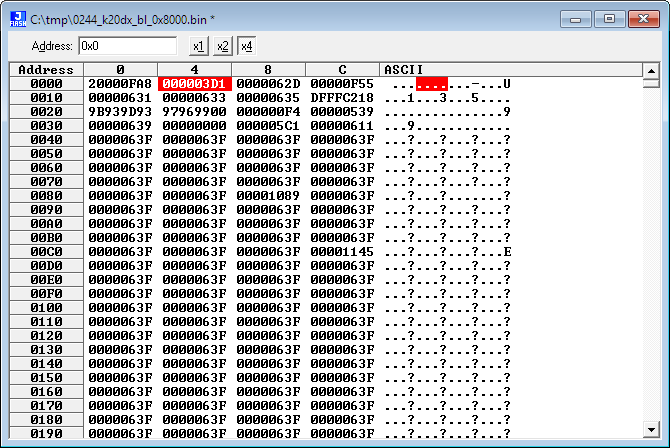 One easy way is to edit directly the .bin file with a binary file editor. 💡 Using the SRecord tool to manipulate the binary would have been another option. I decided to write it at the end of the vector table which anyway is filled up with the default vector entry 0x0000063F). Fill up with NOP's. While the new ARM mbed DAPlink bootloader solves the Windows 10 vulnerability, has the problem that it does not deal with power on glitches in a reliable way. I have patched the bootloader with an extra delay loop. The same approach to patch any firmware can be used of course for anything else. All what I need is some assembly programming, a binary editor and a SWD/JTAG programmer. This entry was posted in ARM, Boards, Building, CPU's, Debugging, Eclipse, Embedded, FRDM-K22F, FRDM-K64F120M, FRDM-K82F, gcc, Hexiwear, KDS, Kinetis, TinyK20, Tips & Tricks, Tutorial, TWR-K64F120M and tagged ARM, arm gcc, Assembly, Bootloader, Building, DAPLink, Debugging, Eclipse, Flashing, freedom board, gnu gcc, K20D50M Freedom Board, Kinetis Design Studio, KL25Z Freedom Board, KL46Z Freedom Board, mbed, NXP, OpenSDA, patch, Segger, software, technology, Tips&Tricks, tool chains, vector table by Erich Styger. Bookmark the permalink. LDR R1, =0x400ff00c to ‘create a pointer to GPIOA_PTOR. thanks! The microcontroller is running thumb instructions, and because of this large constants cannot be directly loaded. One way is to store the constant in the code (at the end of the functio), then load the PC relative address of it adn load it register indirect. To me an easier way is to simply build that constant on the fly as I did (yes, I was lazy). About building the bootloader: I had made that suggestion several times in the past to several ARM engineers. I doubt it will ever happen. Making things easier for ARM internally seems to have a higher priority than making things easier for the ones using ARM. That’s something I see in other places too, btw.